Are you looking for adding some variety to your pregnancy diet? Are you bored of drinking cow’s milk every day and now want to experiment with your dairy intake? Have you considered drinking almond milk during pregnancy? Almond milk is not a recent discovery. People in the middle ages enjoyed their almond milk and preferred drinking it to consuming cow’s milk. But is almond milk safe for consumption during pregnancy? When you are pregnant, you to need think twice before experimenting with what you eat and drink. So, it makes sense to find out all about almond milk before adding it to your pregnancy diet! Almond milk contains vitamin E, which has antioxidant properties. It can help prevent oxidative stress that comes with the wear and tear of pregnancy (1). Almond milk contains a high amount of omega-3 fatty acids, which helps to keep the heart healthy (2). If you are a vegan, almond milk is the drink for you! It contains no animal by-products and will fit right in with your vegan pregnancy diet. Your bones need extra nutrition when you are pregnant. That is why you need a calcium-rich diet during pregnancy (4). Almond milk is a great source of calcium and will help keep your bones healthy and strong. High blood pressure is a serious concern during pregnancy as it can lead to preeclampsia. The calcium in almond milk can go a long way in keeping your blood pressure levels under control (5). According to the Centers for Disease Control and Prevention, the prevalence rate of gestational diabetes is about 9.2% (6)! If you too have gestational diabetes, you should give almond milk a try. It contains ‘good’ sugar that does not impact the body negatively and can help manage GD better. One of the biggest benefits of almond milk is that you do not need a refrigerator to store it! Unlike cow’s milk, almond milk has a long shelf life. If you are planning to travel long distance while pregnant, almond milk will be a must carry. It is common to experience skin problems during pregnancy (7). The vitamin E present in almond milk can help cure the acne and pigmentation and make your skin healthy and radiant. 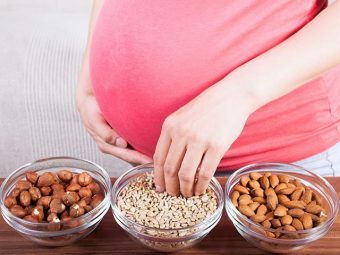 So, these were some of the reasons why almond milk will make a great addition to your pregnancy diet. But there’s more to the story than meets the eye! Almond milk is low in calories, and drinking it can make you feel weak during pregnancy. Almond milk also has lesser fat in comparison with soy milk. If you are allergic to nuts, almond milk won’t be a safe option for you. You can end up suffering from an allergic reaction, which can prove dangerous when you are pregnant. Almond is a goitrogen, which means that it can suppress the functioning of the thyroid gland (8). If you are already suffering from a thyroid dysfunction, you should avoid drinking almond milk. As you can see, the pros of consuming almond milk far outweigh the cons. But do talk to your health care provider before you start drinking almond milk. If he gives you a green signal, you can go ahead and make this yummy beverage a part of your daily menu! Have you tried drinking almond milk during pregnancy? Did you experience any side effects? Share with us! Which Type Of Milk Should You Consume During Pregnancy? 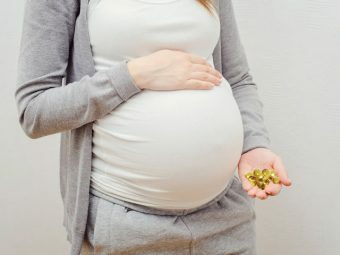 Why Are Prenatal Vitamins Important During Pregnancy? 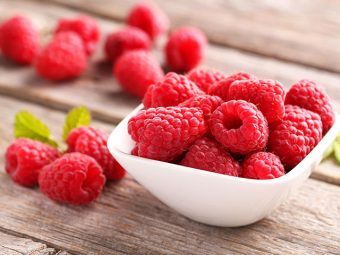 Can You Eat Raspberries When Pregnant?